Far for us to be the ones to brag about anything but...if you happen to be at any major book store over the next few months you may want to pick up the following book. Shark Diver, your favorite neighborhood shark diving company, is featured in this stunningly imaged and worded book under Mexico, Isla Guadalupe. Naturally if there's only "50 Places to Dive Before You Die" Guadalupe has to be featured in there somewhere. 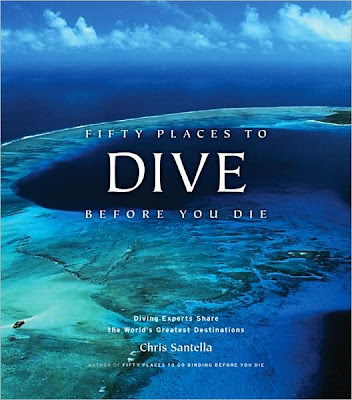 Chris Santella writer, and fly fisher, searched the planet and interviewed some of the industries noted dive adventurers seeking the back stories of the best dive sites around. He got ours on a river in Oregon last summer casting Chernobyl sized hopper imitations to waiting 20 inch browns who sipped these ungainly bugs off the surface like floating over sized Pez. We're not going to tell you what we told him (buy the book) suffice to say after 7 years of operations at Isla Guadalupe we had some stories. Sorry Shredder, you didn't make the cover. That's too bad ol shred did not make the cover, i read your book nice section on lupe next time put a story in about the you know what!